For Northwesterners, summer is the time to find our sunglasses, cook up a Copper River salmon, and hit the road to visit the lovely little and not-so-little towns that abound in our corner of the world. This means that for Northwest lampposts, it’s time to slip into something fresh and flowery. Flower baskets are to lampposts what convertibles are to summer road trips—not required, but just and fitting. 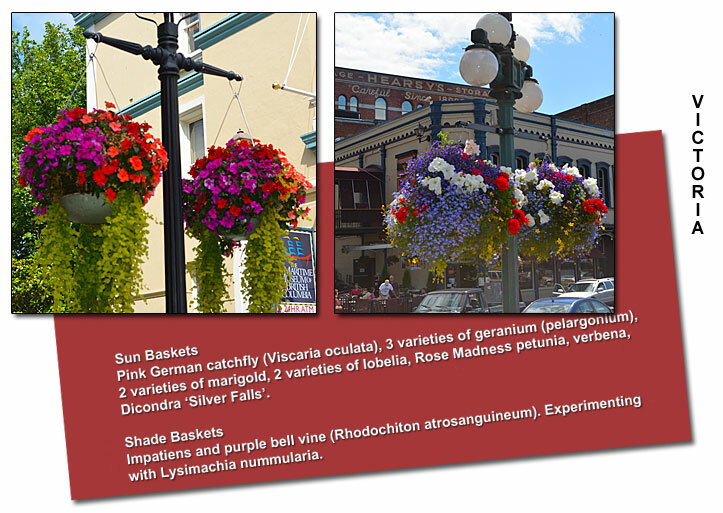 All along Main Streets from Oregon to British Columbia, hanging baskets are a summertime staple. After all, nothing says “welcome to our city” like bright, bodacious bouquets of blossoms. In the communities that adopt them, hanging baskets are painstakingly planned and planted, conscientiously watered and fed. Plant choices are evaluated and tweaked. Flower baskets are ambassadors of the town. Victoria led the lamppost charge in 1937, bedecking its downtown with baskets to commemorate the city’s 75th anniversary of incorporation. Now, 74 years later, it wouldn’t be summer in Victoria without them. The city grows the plants in its own greenhouses at Beacon Hill Park. When April arrives, work crews spend up to four weeks planting nearly 1,500 baskets, each weighing 50 to 60 pounds. The baskets go up along 15 streets during the second week of June. Watering takes place by hand by city staff in the middle of the night. Trace amounts of fertilizer are included in the water each night. Plant material is selected for continual masses of small, self-cleaning flowers. David Grayson, Nursery Lead Hand for the City of Victoria, reveals that “something special” in the way of floral displays is being planned around city hall in 2012 in honor of the city’s 150th anniversary. For 12 years, David and Gail Halsaver of Foxglove Nursery in Kingston, WA have not only grown the plants and designed the lamppost baskets for their little town on the Puget Sound, but Gail, as the chairperson of the Kingston Beautification Committee, is also responsible for the installation and maintenance of the baskets. When it comes to watering, Kingston relies on teams of volunteers. The job is a popular one with a waiting list. Perhaps part of the attraction is the chance to drive the "Gator,” a dune buggy-sized John Deere utility vehicle equipped with a water tank. Teams go out every day to water, a job that takes nearly two hours to complete. Fertilizer is added to the water twice a week. 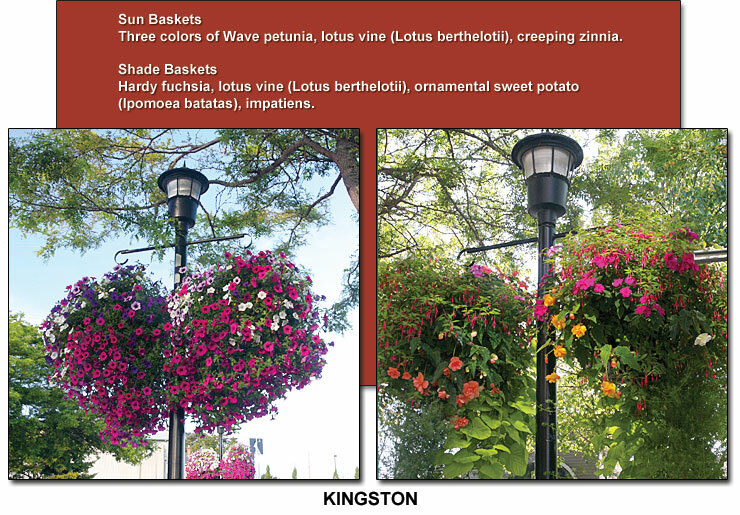 Kingston’s baskets adorn lampposts on three streets of this ferryboat town. Planting starts in the Foxglove greenhouses in March in order to have 118 baskets ready to hang by Mother’s Day. The $3000 cost is covered by fundraising and donations. The main fundraising event is the annual Fourth of July Ball Race; one dollar buys a plastic ball on which is written the donor’s name and phone number. After Kingston’s annual parade, the balls are rolled down the marina road and the winner receives a cash prize. Other funding comes from sponsorships for an initial fee of $100 per basket, and $25 per year thereafter. Toledo is a small-town gem on the Yaquina River, seven miles from Newport on the Oregon Coast. 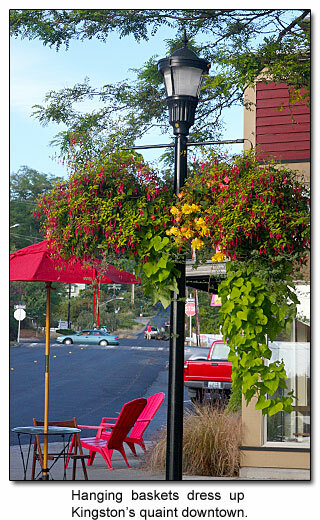 For the past ten years flower baskets from Country Garden Nursery in McMinnville have graced the old-fashioned streetlamps of Main Street. The program was the brainchild of former mayor Sharon Branstiter, a fondly remembered town leader who passed away in April 2007. When Highway 20 was reworked in 2005, the streetlamps and baskets followed. 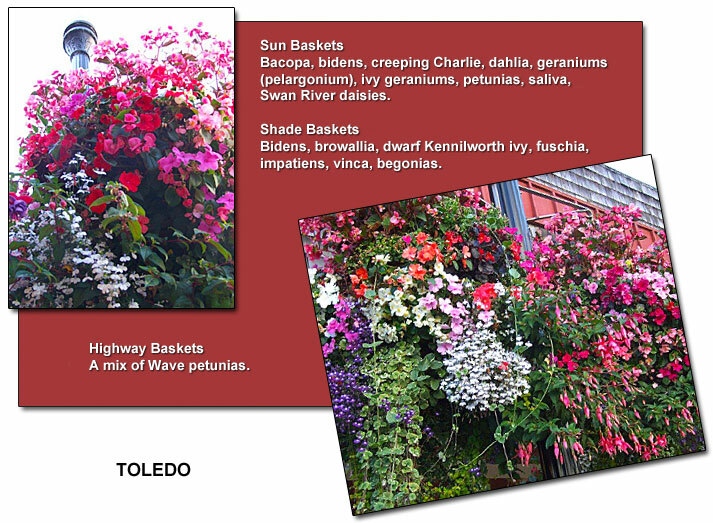 Sponsored entirely by donations from businesses and individuals, the 120 hanging baskets cost a total of $1500 each year. A downtown basket may by sponsored for $140, a highway basket for $75. An automatic drip system waters the baskets twice a day.